Hi, I am interested in your 1956 Chevrolet Bel Air (stock #1716-TPA) listed on Autotrader for $73,995. I'd like to get more information about this vehicle and confirm its availability. When you imagine period-correct motoring, this is what the 50s will look like. 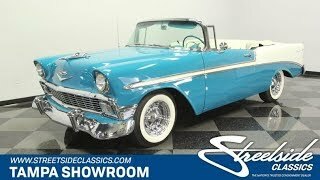 This 1956 Chevrolet Bel Air convertible is the rare droptop treat that has been expertly restored to be nostalgia on wheels. So look over the great two-tone appearance, original details, period-correct V8, and much more. Because when its all completed to such a high level, an icon like this never disappoints. The 56 Chevy has remained the enduring motoring icon because of how well it represented what we wanted in the 50s bright colors, plenty of chrome, and rocket-inspired designs. And this one does it best. First and foremost is the two-tone. The India Ivory and Twilight Turquoise are the colors this car was born with, and the quality professional respray proves they really know how to attract attention. Even the white convertible top and classic whitewall tires are part of this fantastically coordinated package. Plus, the way the Bel Air line has that harpoon of color running the full profile is an exclusive touch for this year that no factory would ever dare try again. And speaking of exclusive to 56, the grille is a great piece. Larger than 55 and sleeker than 57, you can easily recognize this model from a long way away. Plus, with the full trim, bumpers, smooth wheel covers, and all the emblems complete, this is a total package thats worth its weight in exclusive brightwork. And while the pictures tell the story of a fantastically complete car, you really get extra pride in ownership when you feel the details like the pliable rubber around the clear glass, and the way the long classic doors close with authority. Because a convertible is meant to be shared with the world, with the flip of a switch, the white top powers down to reveal more of this fantastically coordinated package. The two-tone continues on the inside with white seats and textured turquoise inserts. This button-top design has that kind of cool true 50s style. These are the factory-correct colors for the car, but the fresh feeling tells you there was a solid investment here. Intricate door panels, the proper color-matched Bel Air steering wheel, and a bright dash with the sporty dual cowl design its all part of a thoughtful total package down to the last detail. Even the glove box light still works! In fact, the few upgrades that were added were done with the right care. You see it in the color-matched seatbelts, cleanly installed engine temp gauges, and the retro-style AM/FM cassette player that fits in the factory placement. It creates a time capsule-like atmosphere that also allows you to confidently cruise the roads of today. Part of what makes these cars a legend is that the Tri-Fives were the ones to introduce the Chevy small block V8. So youll be happy to lift the hood and see a 265 cubic-inch V8 boldly radiating from within the engine bay. They made sure this was ready to show off with the glossy black fender walls, color-matched firewall, polished cursive valve covers, and matching air topper. Its just the right amount of flair in this ultra-tidy engine bay to give a great presentation to all the original style components everything from the generator to the Carter four-barrel carburetor. Even the undercarriage looks great. But this great presentation hides this cars true secret... its built to drive. The motor was rebuilt less than 2,000 miles ago, and they even upgraded the automatic transmission to a more versatile three-speed unit. Plus, its a power steering car that feels smooth out on the road. So feel free to enjoy this Bel Air droptop to the fullest. The sale comes complete with maintenance records as well as original components, color-matched steelie wheels, and fender skirts. This is the 56 Bel Air convertible that has been restored for true distinction. So if you demand an upper-class classic, call today!